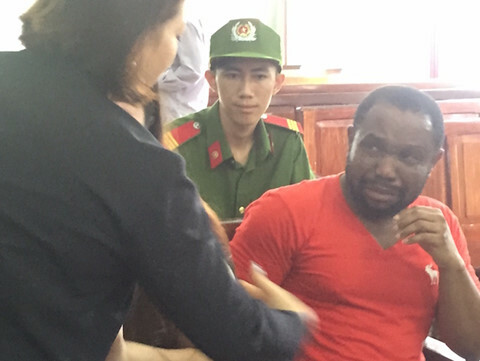 A Southern Vietnam court has sentenced a Nigerian to 18 years in prison over a fake customs enforcement scam, state media reported on Friday. A local media reported that Michael Ikechukwu Leonard, 45, was convicted on Thursday of “deceiving others to steal their assets” in a scam which targeted wealthy Vietnamese women. The court in Can Tho city determined that Leonard gained his victims’ trust on messaging apps using various alter egos, including a U.S. army officer. The convict was said to have promised to send his victims valuable presents, including laptops and jewellery from the U.S.
Local accomplices, Huynh Ha Binh, Huynh Ha Uyen and Nguyen Tran Quynh Nhi, would then contact the women claiming to be customs agents and demand fees or fines for the non-existent shipments. They successfully conned a woman in Can Tho out of 28,500 dollars, leading to their arrest. It is unclear how many women were duped by the gang in total. Leonard’s accomplices received sentences ranging from 12 to 15 years. Who can blame him,Nigerian leaders have turned our once beautiful and prosperous country to a land poverty and desperation,where people have to turn to tricksters,just feed.Shame on you Nigerian leaders. The situation in Nigeria should not be an excuse for scams and fraudulent activities. Nigeria youths, learn to be patient and self sufficient. Ill gotten wealth doesn't last. Now he's in jail in another man's land, who's there with him?